Animal Biotechnology Division, ICAR-National Bureau of Animal Genetic Resources, Karnal-132 001, Haryana, India. Seasonal variation imparts environmental stress in dairy animals, and impairs animal health and productivity. In order to measure the performance ability of a particular breed/animal towards heat stress, it is imperative to determine its thermotolerance ability. Heat shock proteins (HSPs) are molecular chaperons that maintain native conformation of proteins and cell viability during stress period. The peripheral blood mononuclear cells (PBMCs) have been widely utilized as a cellular model to understand the differential heat shock response across livestock species. The present investigation was attempted with the assumption that seasonal variation can lead to changes in the level of heat shock protein transcripts in dairy breeds. Therefore, this study aimed at assessing the transcriptional stability of heat shock protein family genes and cell proliferation rate in Sahiwal cows (Bos indicus), Holstein cows (Bos taurus) and Murrah buffaloes (Bubalus bubalis). The basal expression level of heat shock protein family genes (HSP27, HSP40, HSP60, HSP70 and HSP90) were analysed in PBMCs during peak summer and winter seasons. In comparison to Sahiwal cows and Murrah buffaloes, relative expression data showed significant induction of HSP70, HSP40, HSP60 and HSP90 mRNA in HF cows during summer stress. The cell proliferation data further indicated significant (p<0.05) inhibition of cell proliferation in Holstein cows during summer stress. Overall data on transcriptional stability of HSPs mRNA and cell proliferation suggested better survivability of Sahiwal cows PBMCs to summer stress in comparison to HF cows. Heat shock protein (HSP) genes, Gene expression, Cell proliferation rate, Summer stress, Sahiwal cows, Holstein cows. India is bestowed with immense richness of agricultural biodiversity wherein farm animal biodiversity plays a predominant role in the rural economy. A large and divergent range of agro-ecological zones in India has helped to develop significant number of naturally evolved cattle and riverine buffalo breeds. Indian native cattle (Bos indicus) and buffaloes (Bubalus bubalis) are recognized as major milk producing species in the Indian sub-continent and hence their production performance during summer stress is of great significance to both farmers as well as dairy sector. The native cattle genetic resources are the backbone of the farmer’s economy since centuries producing milk as well as draft power. India has over 204.58 million or approximately over 15.97% of the total world cattle population and is home to some of the best zebu (Bos indicus) breeds represented by 37 well-defined breeds. Besides these, many lesser known cattle populations are also spread out in the length and breadth of the country each having its own special features. Many of these breeds have potential of not only surviving but also to sustain production, reproduction and draught power under various harsh climatic conditions. The Indian native cattle viz. Tharparkar, Hariana, Sahiwal, Rathi, Gir, Kankrej and Nagori etc. are known for their adaptability to high temperature, production potential and powerful draught capacity. Similarly, India bestowed with immense richness of buffalo diversity and has over 96.9 million buffaloes constituting more than half (56.8%) of the total world (170.4 million) and 58.9% of Asian buffalo population (165.4 million), respectively (FAO 2004). India has 13 well defined and diverse riverine buffalo breeds, known for high yield, fat rich milk and their adaptability traits. Buffalo has a special significance in the dairy industry in India and contributes more than 50% of total milk production besides its role as draught power and meat source. Though buffaloes are also suited to hot and humid climates yet they exhibit signs of distress when exposed to direct solar radiation or when working in the sun during hot weather. It is reported that milk yield, growth rate and fertility of buffaloes get reduced during periods of high ambient temperature . This is due to the fact that buffaloes absorb a great deal of solar radiation because of their dark skin and sparse coat or hair. In addition, they possess a less efficient evaporative cooling system due to their rather poor sweating ability. Also, buffalo skin has one-sixth of the density of sweat glands that cattle skin has, so buffaloes dissipate heat poorly by sweating. Under heat stress, buffalo’s body temperature, pulse rate, respiration rate and general discomfort increase quickly. The reduction in milk yield in buffaloes during heat stress is a major concern for dairy sector in India. Heat stress is a significant issue for many livestock enterprises. The impact of heat stress on dairy animals have been well documented [2-6] and include reduced feed intake but greater nutritional energy requirement, reduced fertility, increased respiratory and heart rates, panting activity, increased peripheral blood flow and sweating, reduced milk production, lower milk quality. Collectively, these changes indicate that there is major strain to the animals that ultimately results in increased frequency of health related issues like mastitis, rumen acidosis and ketosis . These impacts can result in significant loss of income and increase in management costs. Estimates for average animal losses resulting from heat stress for the US dairy industry were conservatively estimated at about US$900 million per annum . These apprehensions have increased even more in recent years with the increased global warming and strive of dairies to maximize milk production. However, with the increase of milk production and dry matter intake increase, cow's metabolic heat output increases, which further increases sensitivity to heat stress  that not only affects herd milk production and income, but impacts on cow fertility, health and welfare that lasts well beyond seasonal hot weather and can double these losses. Hansen  reported that zebu cattle have better ability to regulate body temperature in response to heat stress than taurine cattle breeds of European origin. However, till now no systematic attempts have been made to compare the cellular tolerance of Indian native cattle (Bos indicus), exotic cattle (Bos taurus) and buffaloes (Bubalus bubalis) towards heat stress. At cellular level, peripheral blood mononuclear cells (PBMCs) have been utilized as a potential model to assess the differential heat stress response in cattle, and other livestock species [10-15]. The present study was carried out with aim to analyze the differential gene expression of HSP genes in PBMCs of Indian cattle (Bos indicus), Holstein-Friesian (HF) cattle (B. taurus) and Indian buffaloes (B. bubalis) towards thermotolerance and adaptive mechanism to seasonal variation. Dairy breeds especially the high-producing animals are typically more sensitive to heat stress as they generate more metabolic heat . The heat stress effect becomes more detrimental when heat stress is accompanied with high ambient humidity . This issue holds specific importance when the scenario of global warming is considered. Exposure to higher temperature-humidity index for longer periods decreases the ability of lactating dairy cow to disperse heat. To regulate the body temperature, animal body undergoes several adaptive mechanisms at physiological and cellular stages. The physiological changes include dilatation of blood vessels in the outer dermis layer that enables the blood flow to the skin surface for efficient heat loss, sweat production at skin surface by sweat glands to bring the cooling effect. The combination of PBMCs as cellular model and response of HSPs has been widely explored as a suitable evaluator of heat stress at cellular level [10,11] including effect of seasonal variation and adaptive mechanism [10,11,17]. Towards adaptation to heat stress, taurine and indicine cattle as well as Indian buffalo respond different as they exhibit different morphological, anatomical and physiological parameters  and exhibit differential cellular response . HSPs have a significant role in cell thermo tolerance  and its expression acts as a potential indicator of animal adaptation to harsh environmental stress . The present study was carried out with the aim to evaluate transcriptional stability of HSP genes and cell proliferation rate in PBMCs of Sahiwal (Bos indicus), Holstein-Friesian (Bos taurus) cows and Murrah buffaloes (Bubalus bubalis) to gain insight into their comparative thermotolerance ability to summer stress. Sample consisted of 52 officially registered adult Minorcan horses (24 males and 28 females) aged more than 2.5 years (ranged from 3 to 16 years, averaged 8 years). The animals belonged to 48 different owners, and were kept in different local farms and riding centres, with uniform management and feeding conditions in all locations. In the present study, a total of 15 lactating dairy animals, 5 each of Murrah buffaloes (Bubalus bubalis), Sahiwal (Bos indicus), and Holstein-Frisian (Bos taurus) cows were included. Sahiwal cows and Murrah buffaloes included in the study belong to cattle farm of National Dairy Research Institute (NDRI), Karnal, while Holstein Friesian cows are maintained at nearby private cattle farm. Blood samples (15 ml) were collected from jugular vein into the EDTA coated vaccutainers during hot summer (month of July with average temperature of 41 ± 1°C and temperature humidity index ≥ 85) and cold winter (month of December with average temperature of 12 ± 1°C and temperature humidity index ≤ 72). The sampling procedure was conducted as per the institute animal ethics committee guidelines in place. The collected blood samples were processed within 2 h for PBMCs isolation as described in our previous study . Briefly, the whole blood was diluted with 1X PBS (Ca2+ and Mg2+ free; Hyclone, Utah) and was gently over laid on Histopaque-1077 (Sigma- Aldrich Inc., USA) at room temperature. The mixture was centrifuged at 400G for 30 min. The plasma was discarded and white ring of mononuclear cells were aspirated to a fresh tube. The aspirated cells were treated with 2.0 ml of chilled filtered RBC lysis buffer for 2 min. Immediately after lysis, 8.0 ml of 1X PBS (Ca2+ and Mg2+ free; Hyclone, Ultah) was added and centrifuged at 260x g for 10 min to remove the traces of Histopaque-1077 and RBCs. Washing of PBMC pellet with 1X PBS was repeated twice. A small aliquot of purified cells (9.0 μl) was mixed with 1.0 μl of trypan blue dye for cell viability count. The cell proliferation rate of PBMCs was measured using CyQuant cell proliferation assay (Molecular Probes). The CyQuant cell proliferation assay is based on the principal that the amount of DNA in each cell remains constant for a given cell line or cell type, so assays based on DNA content can be used to provide an accurate and simple measure of cell number. Procedure was followed according to the manufacturer's instructions. In brief, the purified PBMCs cell pellet was suspended in 1X HBSS buffer. 50 μl aliquot of cell suspension containing 105 cells was dispensed in triplicate in microplate wells. Then, 50 μl of 2X dye binding solution was added into each microplate wells and incubated the plate at 37ºC for 45 minutes. This incubation is required for equilibration of dye-DNA binding, resulting in stable fluorescence endpoint. Finally the fluorescence intensity of each sample was measured using a fluorescence plate reader (Perkin Elmer Victor X3) with excitation at 485 nm and emission detection at 530 nm. Total RNA extraction and cDNA synthesis was performed as described in previous study . The high quality RNA (Average O.D.260/280 ≥ 2.0) as estimated using NanoDrop ND-1000 spectrophotometer (NanoDrop Technologies) was used for cDNA synthesis. The integrity of total RNA isolated was checked by visualization of 18s and 28s ribosomal bands on 1% denaturing agarose gel. The quality of synthesized cDNAs was checked using semi-quantitative PCR. A gene-specific PCR amplification was performed in 10 μl reaction mixture containing 4 μl of cDNA template, 0.4 μl of forward and reverse primer each (working concentration - 4pmol), 1 μl PCR buffer (1X), 0.75 μl MgCl2(1.5 mM), 0.5 μl dNTPs (200 μM) and 0.2 μl Taq DNA polymerase (1.0 U) (Invitrogen, Carlsbad, CA, USA). Amplification was performed in Master cycler gradient thermal cycler (Eppendorf, Germany) using thermal cycling conditions as 95°C for 2 min, followed by 35 cycles of 95°C for 30 s, 60°C for 30 s, and 72°C for 30 sec with a final extension at 72°C for 5 min. The amplicons were analyzed for their specific size by agarose (1.5%) gel electrophoresis. qPCR was performed using Light Cycler 480 instrument (Roche, Germany). Each reaction in a 96 well white plate (Roche, Germany) was comprised of 4 μl diluted cDNA combined with 6 μl of a mixture composed of 5 μl 2X LightCylcer 480 SYBR Green I master mix (Roche, Germany), 0.4 μl each of 10 μM forward and reverse primers, and 0.2 μl DNase/RNase free water. For each gene, samples were run in duplicate (technical replicates) along with 6 point relative standard curve plus the non-template CTR. The reactions were performed with amplification conditions: 2 min at 50°C, 10 min at 95°C, 40 cycles of 15 s at 95°C (denaturation), and 1 min at 60°C (annealing+extension). A dissociation protocol with an incremental temperature of 95°C for 15 s plus 65°C for 15s was used to investigate the specificity of the qPCR reaction and the presence of primer. The basal expression level of major heat shock protein genes (HSP27, HSP40, HSP60, HSP70 and HSP90) as described in Table 1 were analyzed in PBMCs samples. The analysis of mRNA expression data across different samples was based on cycle threshold (CT) values. For estimation of expression level of HSP genes, the cycling threshold (CT) values were normalized using β-actin (ACTB) as internal control gene. The CT values of each of the target gene were subtracted from the CT values of the β-actin to calculate Δ CT. Analysis of variance (ANOVA) was performed to determine the presence or absence of significant differences in the analytical variables among different groups using GraphPad PRISM version 5.0 (La Jolla, CA, USA) statistical software package and the differences between groups were tested by Tukey's Multiple Comparison Test. P values less than 0.05 and 0.01 were considered significant. To understand the relationship between expression stability of major chaperones, animal types and seasonal variations, qPCR expression data was generated in PBMCs samples across Sahiwal cows (Bos indicus), exotic Holstein Frisian (Bos taurus) cows and Murrah buffaloes (Bubalus bubalis). The major objective of this study was to determine whether seasonal variation impacts transcription of major chaperones and cell proliferation rate of PBMCs in Sahiwal, Holstein Frisian cows and Murrah buffaloes or not. High quality RNA was obtained for all the PBMCs samples as indicated by A260/A280 ratio of 2.07 ± 0.04 for Sahiwal cows, 2.10 ± 0.62 for HF cows and 2.08 ± 0.05 for Murrah buffaloes. Melt curve analysis of qPCR reactions with single peak for each gene indicated specific and efficient PCR amplification (R2 ranged from 92.50 to 115.0, Table 1). aqPCR efficiencies for each primer pair was calculated from 6-point standard curves using 5-fold dilution series of pooled cDNA from cow and buffaloes samples. Among different HSP genes analyzed, HSP70 displayed major difference in expressional level with fold change of 4.55 in Holstein Frisian cows (p<0.001), followed by fold change of 1.73 in Murrah buffaloes (p=0.31) and fold change of -0.31 in Sahiwal cows (p=0.50) in summer with respect to winter season. The relative expression data of HSP70 mRNA showed maximum induction in Holstein Frisian cows during summer season (Figures 1 and 2). Its expression was also high in Murrah buffaloes though the increase was non-significant (p>0.05). On the other hand, only minor change was observed in the expression of HSP70 mRNA in Sahiwal cows during the two seasons. Similar to HSP70, HSP40 mRNA showed significant (p<0.05) induction in Holstein Frisian, non-significant (p>0.05) induction in Murrah buffaloes and almost no change in Sahiwal cows during summer in comparison to winter period (Figures 1 and 2). Two more chaperones (HSP90 and HSP60) transcripts showed similar pattern, with highest induction in Holstein Frisian, followed by Murrah buffaloes and Sahiwal cows. Interestingly, HSP27 mRNA showed reverse trend as its expression was albeit non-significant (p>0.05) during winter in comparison to summer season in all the animal types (Figures 1 and 2). Though it is difficult to explain this trend but one reason that could be put forth is that HSP27 might have a constitutive expression and is probably not a very sensitive marker for summer stress unlike like other studied chaperones in the studied animals. 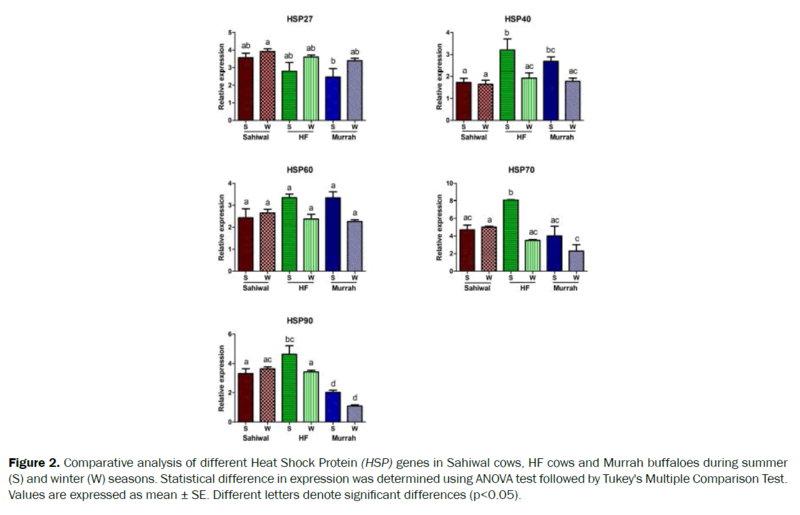 Figure 1: Transcriptional stability of different Heat Shock Protein (HSP) genes in PBMCs of Sahiwal cows in comparison to Murrah buffaloes and Holstein-Friesian (HF) cows across summer and winter season (Significance at *p<0.05, **p<0.01 and ***p<0.001). Figure 2: Comparative analysis of different Heat Shock Protein (HSP) genes in Sahiwal cows, HF cows and Murrah buffaloes during summer (S) and winter (W) seasons. Statistical difference in expression was determined using ANOVA test followed by Tukey's Multiple Comparison Test. Values are expressed as mean ± SE. Different letters denote significant differences (p<0.05). Amongst different dairy animal types analyzed in the present study, Sahiwal cows exhibited minimum expression fold change with non-significant differences for all the HSP genes (fold change for HSP27=0.36, p=0.24; HSP40=0.08, p=0.78; HSP60=-0.22, p=0.59; HSP70=-0.31, p=0.51; and HSP90=-0.33, p=0.33) in summer with respect to winter season. Whereas, Holstein Frisian cows showed maximum difference in HSP40 (fold change=1.28, p=0.04), HSP70 (fold change=4.55, p<0.001) and HSP90 (fold change=1.20, p=0.0) while, Murrah buffaloes showed maximum difference in HSP27 (fold change=-0.93, p=0.20) and HSP60 (fold change=1.07, p=0.03) during summer and winter. Additionally, apart from analysing the inducibility of individual HSP mRNA expression to summer stress, we also assessed the overall changes in expression pattern of four HSP transcripts (HSP70, HSP40, HSP60 and HSP90) by combining the expression data. The analysis was conducted by including HSP27 mRNA expression values. This was primarily done to evaluate, whether HSP27 mRNA data that showed different expression trend has any effect on overall HSPs expression pattern. Our analysis revealed that HSP27 expression values had no effect on combined expression data set (Figure 3). Pooled expression data for all the HSPs together showed similar trend to that of individual HSP mRNA. The combined expression values for HSP70, HSP40, HSP60 and HSP90 genes together showed maximum and significant (p<0.01) induction in Holstein Frisien cows compared to Sahiwal cows and Murrah buffaloes (Figure 3). Figure 3: Pooled expression values for all HSP genes in Sahiwal cows, HF cows and Murrah buffaloes during summer(S) and winter (W) seasons (Significance at *p<0.05, **p<0.01 and ***p<0.001). The cell proliferation data indicated significant (p<0.05) inhibition of cell proliferation in Holstein cows followed by Murrah buffaloes during summer stress (THI-85; Figure 4). The PBMCs of Sahiwal cows showed more resistant to heat stress because the decline in their cell proliferation rate was much less as compared to Holstein and Murrah buffaloes. Figure 4: Proliferation response of PBMC of different cattle types and Murrah buffaloes during summer and winter season. Values are mean ± SE (n=12), Data were analysed by ANOVA followed Dunett’s test, p<0.05; bars having different superscripts are significantly different at 5% level. Recently, much emphasis has been given to understand the mechanism of molecular adaptation in livestock breeds towards climatic changes especially heat stress. It is now a well-established fact that there is variability at breed or species level to tolerate the environmental heat load. However, such data is grossly lacking for Indian native cattle and buffalo breeds which are considered to have evolved with superior thermotolerance ability than their exotic counterparts. The present investigation was attempted with the assumption that seasonal variation can lead to changes in the level of heat shock protein transcripts to different extent in dairy breeds adapted to tropical and temperate climatic conditions. Therefore, this study aimed at assessing the relative expression profile of HSPs (HSP40, HSP60, HSP70 and HSP90) transcripts in circulating PBMCs of Bos indicus (Sahiwal) cows, Bos taurus (Holstein Frisian) cows and Bubalus bubalis (Murrah) buffaloes in summer and winter season. The PBMCs of exotic Holstein cows showed maximum induction in HSP transcripts (HSP70, HSP60, HSP40 and HSP90) in comparison to tropically adapted Murrah buffaloes and Sahiwal cows during summer stress. Amongst all HSP genes examined in this study, HSP70 was found to be most induced in Holstein Friesian (Figure 1). This was expected as HSP70 expression is considered to be most induced during thermal stress in order to stabilize the native conformation of proteins and maintenance of cell survivability (Beckham et al., 2004). The observed increase in its expression due to summer stress was in accordance with studies carried out in different livestock species [10,12,19-22]. In addition to HSP70; HSP40, HSP60 and HSP90 heat shock protein genes that contribute to thermotolerance were also studied. HSP40 and HSP90 generally function as a co-chaperone/cofactor of mammalian HSP70 and the complex is involved in the restoring of protein confirmation after heat shock [23-25]. HSP60 is another important molecular chaperon under various stressful conditions . These HSPs are known for their primary role as molecular chaperons that ensures the correct protein folding and apoptosis regulation during physiological stressful conditions. Putting together, the relative mRNA expression of HSP40, HSP60, and HSP90 was significantly higher during summer as compared with winter season in Holstein cows. The findings are similar to the observations made for different HSPs in goats . The observed higher abundance of HSPs is crucial in providing cytothermal protection during summer stress [27,28]. Several reports have also demonstrated the important role of HSPs in cell survival under heat stress conditions both in vitro and in vivo [12,14,29]. The cell proliferation data of the present study was in corroboration with our previous findings , where the percent reduction in cell viability especially post-heat stress was highest in PBMCs of Holstein cows followed by Murrah buffaloes and Sahiwal cows. The present study suggested that a PBMCs of Sahiwal cow (Bos indicus) which is an adapted to tropical condition of India has better survivability to summer stress in comparison to Hostein Frisian cows (Bos taurus). These results are consistent with earlier findings where lesser deleterious effect of high temperature was observed on preimplatation embryos and cells from Bos indicus cattle [3,30,31]. In conclusion, the extent of HSPs mRNA expression and cell proliferation rate of PBMCs of Sahiwal, Holstein Frisian cows and Murrah buffaloes showed difference in their ability to ameliorate the deleterious effect of heat stress so as to maintain cellular integrity. The HSP transcripts in Sahiwal cows showed minimum change in expression with change in season. This provides an evidence for its better cellular tolerance and adaptability than that of exotic Holstein cows. On the other hand, Holstein Friesian animals with higher abundance of four major HSP transcripts (HSP90, HSP70, HSP60, and HSP40) during summer season indicated their lower tolerance to environment heat load especially in tropical conditions. Although heat shock response is an evolutionary conserved mechanism, different breeds/species as seen in the present study may vary in their inherent ability to induce HSP synthesis during heat shock. Higher expression of HSPs and low cell proliferation rate in Holstein cows could well be related to the higher stress state of animals, requiring more production of heat shock proteins to cope up with the stressed state. The work was supported by Indian Council of Agriculture Research, New Delhi under National Fellow Scheme. The authors duly acknowledge, Director NBAGR, Karnal for extending the research facilities for this study. Marai IFM andHaeeb AAM. Buffalo's biological functions as affected by heat stress-a review. Livestock Science.(2010);127:89–109. Dunn RJH, et al. Analysis of heat stress in UK dairy cattle and impact on milk yields: Environmental Research Letters. (2014);9:6. Hansen PJ. Physiological and cellular adaptations of zebu cattle to thermal stress. AnimReprod Sci. (2004);83:349–360. Klinedinst PL, et al. The potential effects of climate change on summer season dairy cattle milk production and reproduction. Climate Change.(1993);23:21-36. Kadzere CT, et al. Heat stress in lactating dairy cows: a review. Livest Prod Sci. (2002);77:59–91. West JW, et al. Effects of hot, humid weather on milk temperature, dry matter intake and milk yield in lactating dairy cows. J Dairy Sci. (2002);86:232-242. Little S and Campbell J. Cool cows- Dealing with the heat stressin Australian dairy herds. Dairy Australia.(2002);52. St-Pierre NR, et al. Economic Losses from Heat Stress by US Livestock Industries. J Dairy Sci. (2002);86:E52-E77. Collier RJ, et al. Quantifying heat stress and its impact on metabolism and performance. ProcFlorida Ruminant Nutrition Symp. (2002);74–83. Agnew LL and Colditz IG. Development of a method of measuring cellular stress in cattle and sheep. Vet Immunol. Immunopathol. (2008);123:197–204. Dangi SS, et al. Expression profile of HSP genes during different seasons in goats (Capra hircus). Trop Anim Health Pro. (2012);44:1905–1912. Kishore A, et al. Peripheral blood mononuclear cells: a potential cellular system to understand differential heat shock response across native cattle (Bosindicus), exotic cattle (Bostaurus), and riverine buffaloes (Bubalusbubalis) of India. Cell Stress Chaperones.(2014);19:613-621. Lacetera N, et al. Lymphocyte functions in dairy cows in hot environment. Int J Biometeorol. (2005);50:105–110. Lacetera N, et al. Heat stress elicits different responses in peripheral blood mononuclear cells from Brown Swiss and Holstein cows. J Dairy Sci. (2006);89:4606–4612. Patir H and Upadhyay RC. Interrelationship between Heat Shock Protein 70 (HSP70) and Lymphocyte Proliferation in Thermal Exposed Buffalo Heifers. Ital J Anim Sci. (2007);6:1344-1346. Bernabucci U, et al. Metabolic and hormonal acclimation to heat stress in domesticated ruminants. Animal.(2010);4:1167–1183. Banerjee D, et al. Seasonal variation in expression pattern of genes under HSP70 family in heat- and cold-adapted goats (Capra hircus). Cell Stress Chaperones.(2014);19:401-408. Beckham JT, et al. Assessment of cellular response to thermal laser injury through bioluminescence imaging of heat shock protein 70. PhotochemPhotobiol.(2004);79:76–85. Basirico L, et al.Cellular thermotolerance is associated with heat shock protein 70.1 genetic polymorphisms in Holstein lactating cows. Cell Stress Chaperones.(2011);16:441–448. Lacetera N, et al. Heat shock impairs DNA synthesis and down-re gulates gene expression for leptin and Ob–Rb receptor in concanavalin A-stimulated bovine peripheral blood mononuclear cells. Vet ImmunolImmunopathol.(2009);127:190–194. Panwar HN, et al. Heat and cold stress enhances the expression of heat shock protein 70, heat shock transcription factor 1 and cytokines (IL-12, TNF- and GMCSF) in buffaloes. ICJMAS.(2014);3:307-317. Manjari R, et al. HSP70 as a marker of heat and humidity stress in Tarai buffalo. Trop. Anim. Health Prod.(2015);47:111-6. Welch WJ. The mammalian stress response: cell physiology and biochemistry of stress proteins. In: Morimoto RI, Tissieres A, Georgopoulos C (eds) Stress proteins in biology and medicine. Cold Spring Harbor Laboratory Press, Cold Spring Harbor.(1990);223–278. Morimoto RI. Regulation of the heat shock transcriptional response: cross talk between a family of heat shock factors, molecular chaperones, and negative regulators. Genes Dev. (1998);12:3788–3796. Pratt WB and Toft DO. Regulation of signalling protein function and trafficking by the hsp90/hsp70 based chaperone machinery. ExpBiol Med. (2003);228:111–133. Oksala NKJ, et al. Heat shock protein 60 response to exercise in diabetes. Effects of α-lipoic acid supplementation. J Diabetes Complications.(2006);20:257–261. Collier RJ, et al. Genes involved in the bovine heat stress response. J Dairy Sci. (2008);91:445–454. Sonna LA, et al. Effects of acute heat shock on gene expression by human peripheral blood mononuclear cells. J Appl Physiol. (2002);92:2208–2220. Hundt W, et al. In vitro effect of focused ultrasound or thermal stress on HSP70 expression and cell viability in three tumor cell lines. AcadRadiol.(2007);14:859–870. Paula-Lopes FF, et al. Genetic divergence in cellular resistance to heat shock in cattle: differences between breeds developed in temperate versus hot climates in responses of preimplantation embryos, reproductive tract tissues and lymphocytes to increased culture temperatures. Reproduction.(2003);125:285–294. Hernandez-CeroJ, et al. Differences in heat tolerance between preimplantation embryos from Brahman, Romosinuano, and Angus Breeds. J Dairy Sci. (2004);87:53–58. Kishore A, et al. Selection of stable reference genes in heat stressed peripheral blood mononuclear cells of tropically adapted Indian cattle and buffaloes. Molecular and cellular probes 2013;27:140-144.